The death of Ann Landers is causing a family feud. 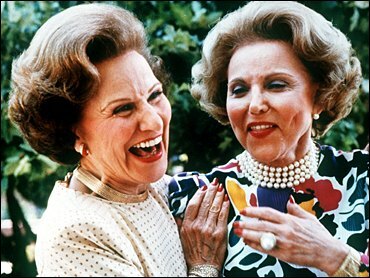 The daughter of advice columnist Esther Lederer, better known as Ann Landers, has accused her cousin, who writes the "Dear Abby" advice column, of trying to cash in on her mother's legacy, according to a published report. "My mother has not been gone a full week yet, and I am highly offended by Jeanne Phillips' not-at-all-subtle move to make hay of my mother's death," Lederer's daughter, Margo Howard, told the Chicago Tribune in Thursday editions. Her comments were prompted by Phillips' Tuesday appearance on CNN's "Larry King Live" show where she expressed grief at her aunt's death. Howard told the Tribune that she also learned Wednesday that Dear Abby's distributor, Universal Press Syndicate, was offering a farewell letter from Phillips to her aunt to newspapers and other media. "This is not about grief," said Howard, who writes an online advice column for Slate Magazine. "This is about new clients." Phillips is the daughter of Lederer's twin sister, Pauline Phillips, originator of "Dear Abby." The two column-writing sisters had a much-publicized feud, and didn't speak for decades. Lederer died Saturday at her Chicago home at the age of 83. The cause was multiple myeloma, a bone marrow cancer. At stake in the wake of Lederer's death are the revenues from the newspapers that subscribed to the Ann Landers column. A statement Wednesday from Universal Press Syndicate said Phillips had turned down several national television shows to discuss her aunt's death, but felt obliged to fulfill an earlier commitment she had made to appear on "Larry King Live." Phillips was booked to appear to talk about a letter she recently turned over to authorities. "As a guest on the show, she could not control content or questions, but she answered the questions that were asked of her about her aunt with the utmost respect and sincerity. We regret that Ms. Landers' daughter and other 'Dear Abby' competitors see her efforts any other way," the statement said. The Tribune reports that Phillips read her farewell on the show. "Her (Phillips') television appearance, flogging her 'grief' at my mother's death, in addition to her 'farewell' column, is beneath contempt," Howard said.